Tempus est mensura motus rerum mobilium. ...and movement has long been used to measure time. For example, the ball clock is a simple device which keeps track of the passing minutes by moving ball-bearings. Each minute, a rotating arm removes a ball bearing from the queue at the bottom, raises it to the top of the clock and deposits it on a track leading to indicators displaying minutes, five-minutes and hours. These indicators display the time between 1:00 and 12:59, but without 'a.m.' or 'p.m.' indicators. Thus 2 balls in the minute indicator, 6 balls in the five-minute indicator and 5 balls in the hour indicator displays the time 5:32. Unfortunately, most commercially available ball clocks do not incorporate a date indication, although this would be simple to do with the addition of further carry and indicator tracks. However, all is not lost! As the balls migrate through the mechanism of the clock, they change their relative ordering in a predictable way. Careful study of these orderings will therefore yield the time elapsed since the clock had some specific ordering. The length of time which can be measured is limited because the orderings of the balls eventually begin to repeat. Your program must compute the time before repetition, which varies according to the total number of balls present. Every minute, the least recently used ball is removed from the queue of balls at the bottom of the clock, elevated, then deposited on the minute indicator track, which is able to hold four balls. When a fifth ball rolls on to the minute indicator track, its weight causes the track to tilt. The four balls already on the track run back down to join the queue of balls waiting at the bottom in reverse order of their original addition to the minutes track. The fifth ball, which caused the tilt, rolls on down to the five-minute indicator track. This track holds eleven balls. The twelfth ball carried over from the minutes causes the five-minute track to tilt, returning the eleven balls to the queue, again in reverse order of their addition. The twelfth ball rolls down to the hour indicator. The hour indicator also holds eleven balls, but has one extra fixed ball which is always present so that counting the balls in the hour indicator will yield an hour in the range one to twelve. The twelfth ball carried over from the five-minute indicator causes the hour indicator to tilt, returning the eleven free balls to the queue, in reverse order, before the twelfth ball itself also returns to the queue. 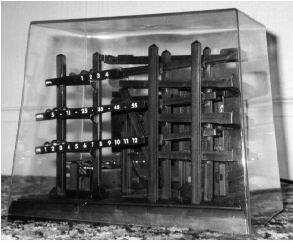 The input defines a succession of ball clocks. Each clock operates as described above. The clocks differ only in the number of balls present in the queue at one o'clock when all the clocks start. This number is given for each clock, one per line and does not include the fixed ball on the hours indicator. Valid numbers are in the range 27 to 127. A zero signifies the end of input. Output For each clock described in the input, your program should report the number of balls given in the input and the number of days (24-hour periods) which elapse before the clock returns to its initial ordering. 30 balls cycle after 15 days. 45 balls cycle after 378 days. 2nd, you can get the period for each ball to get back to the original position. 3rd, Take the least common multiple. 1. Take care of the red marked part of the code, that's the way how to get the period for each ball. That's a smart way to calculate. 2. When calculate the position situation after 24 hours, take care of the number of ball each track can take. Our chemical biologists have invented a new very useful form of life called stripies (in fact, they were first called in Russian - polosatiki, but the scientists had to invent an English name to apply for an international patent). The stripies are transparent amorphous amebiform creatures that live in flat colonies in a jelly-like nutrient medium. Most of the time the stripies are moving. When two of them collide a new stripie appears instead of them. Long observations made by our scientists enabled them to establish that the weight of the new stripie isn't equal to the sum of weights of two disappeared stripies that collided; nevertheless, they soon learned that when two stripies of weights m1 and m2 collide the weight of resulting stripie equals to 2*sqrt(m1*m2). Our chemical biologists are very anxious to know to what limits can decrease the total weight of a given colony of stripies.